One of the major credit card companies used to advertise their card as ‘your flexible friend’. 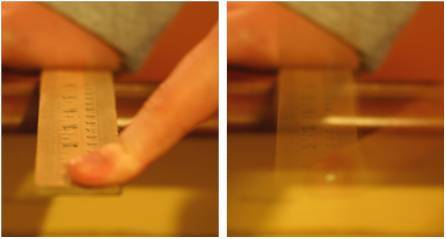 If you clamp your card over the edge of the table and flip it with your finger then it will vibrate at a resonant frequency which decreases with length of the overhang, or cantilever as engineers might call it. You could say that your flexible friend can sing too. I used to use a twelve-inch ruler as everyday example of free and forced vibrations until someone pointed out to me that most engineering students don’t carry them around any longer. So the credit card is a nice alternative that everyone carries with them, although the embossed text of your name and account number makes them a little too stiff and you might find that your plastic driving licence works better. Neither will produce middle C as well as a plastic twelve-inch ruler – you can calculate the resonant or natural frequency by equating the kinetic energy and strain energy of the cantilever, as illustrated in the attached 5E lesson plan. For more on 5E lesson plans see: my post entitled ‘Disease of the modern age’ on June 26th, 2013 and ‘Sizzling Sausages’ on July 3rd, 2013. By the way, kinetic energy is the energy possessed by an object due to its motion and strain energy is the energy stored in an object as result of elastic (reversible) deformation and is equal to the work done in producing the deformation. This entry was posted in energy science, everyday engineering examples, mechanics, Uncategorized and tagged dynamics, Engineering, mechanics on October 9, 2013 by Eann Patterson.